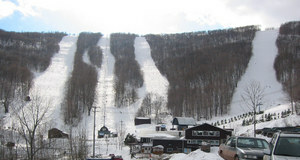 Ski Plattekill in the United States (New York State) is a small ski resort with just 4 ski lifts (2 chair lifts, 2 surface lifts) but it does boast a respectable 306 metres (1005 feet) of vertical descent. Ski Plattekill has 75 acres of terrain over 35 trails. Ski Plattekill is best suited to intermediate skiers and snowboarders but there is some terrain for beginners and advanced skiers. We have no information about the existence of any cross country ski trails at Ski Plattekill. The majority of the trails at Ski Plattekill are covered by snowmaking. The nearest airport is at Albany/Newark and the nearest train station to Ski Plattekill is at Rhinecliff. 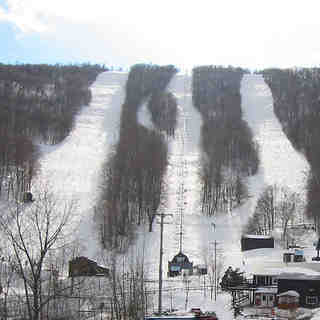 Plattekill (Ski Plattekill) is a family mountain that is all about having fun. It is not fancy, but Plattekill has everything it takes to have a memorable ski experience. The terrain varies from the long, easy Powder Puff, a top to bottom green, to double diamond Blockbuster, a steep, challenging mogul run. The fall line black diamond runs: North Face, Plunge, GS, Freefall and the Face are steep, straight and narrow. While the blues: Ridge, Twist,and The S snake their their way down the bowl shaped mountain. Tree skiing abounds and the locals all have their secret stash. Plattekill gets the most natural snow in the Catskills and due to the smaller crowds and fixed grip lifts, the powder stays for days after a storm. Plattekill may not have status but it sure has soul. If you love to ski you will love to ski Plattekill.